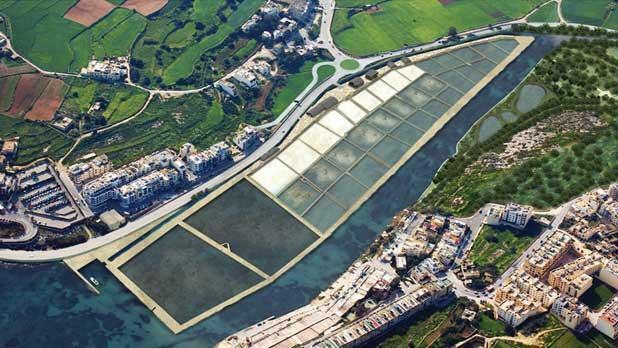 A general shot of the Salini salt pans and what they will look like once the work is completed. The Salini rehabilitation project is on schedule and will be concluded by the end of this year, Rural Affairs Minister George Pullicino and Tourism Minister Mario de Marco said. They said during a visit this afternoon that the aim was for the €7 million project, which started in December 2011, to be concluded by the end of October, beginning of November. The project, 75 per cent of which is funded by the EU, involves the restoration and cleaning of the salt pans, which will return to production after being halted by damage caused by floods. Salt production was badly affected by the floods of 1998 and again in 2003. In the recent floods, the embankment of the pans was badly damaged and the pans (under sea level) were flooded with stagnant water and debris. The wooden huts were also badly damaged and are being rebuilt. They will be used for the storage and processing/packaging of the salt and also as an interpretation centre. At the Ximenes Redoubt on the other side of the road, a visitors’ centre will be set up. This will be linked to the salt pans through an underpass. Storm water canals to contain rainwater are also being built. Mr Pullicino described the saltpans as a treasure, saying they were the only saltpans in Malta which were built on an island. The knights had built them to produce salt for the preservation of food. He said that discussions were underway with local salt producers and an association they will be forming would be producing salt at the saltpans. Tourism Minister Mario De Marco said the area was an important touristic zone having 14 four-star hotels and 15 three-star ones, four guest houses, 15 diving schools and over 200 catering establishments. The zone was associated with seasonal tourism so projects such as this one were needed since they would be a year-round attraction. Dr de Marco said that the fact that January was a good month was an indication that this would be a good year but nothing should be taken for-granted and the country’s competitive edge had to be maintained.